It's been almost 2 weeks since I got him, but I got a new puppy! 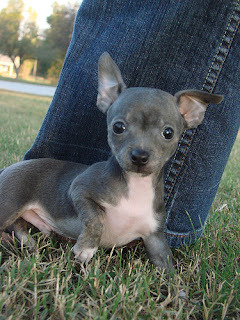 He is a "teacup" chihuahua. He's what they call blue but he's actually gray in color. His name is Toby Macdog and we call him Toby. He's so funny. Here are some pics. He's adorable! I've got a small chihuahua at home as well. Hubby named him Paco (it's all about the heritage! lol) They're great dogs, but beware, they're not good with small children. 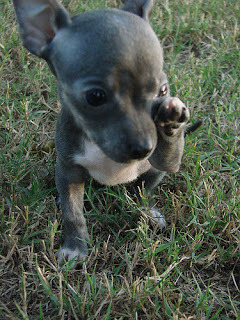 Awh isn't he the cutest and SO tiny! I meant to tell you that I love the new blog. Hope you are doing well Keri.